The Numidia Wreck lies at the North Point of Big Brother Island, in the Red Sea. 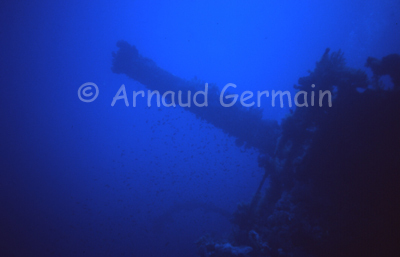 This British ship transporting train parts sank in 1901. it has been colonised by corals. to be honest, I was not looking too much at the wreck when diving there as the North point of Big Brother is one of the best spots to see sharks. I like this picture as it is atmospheric. Sea and Sea Flashgun turned off.